The Social Media Marketing Workbook 2019 edition is your step-by-step guide to social media marketing. The book explains how social media marketing is like “throwing a party” vs. social media, which is like only “attending a party.” It deep dives into the concepts of eWOM (electronic word of mouth), the customer continuum, social (and viral) spread, and trust indicators. Whether you want to market on Facebook or Twitter, YouTube or Yelp, Pinterest or LinkedIn, the Social Media Marketing Workbook will help you master the art (and science) of social media marketing. LEARN: Learn more about the book. GOT QUESTIONS? – just email us or call 800-298-4065.
create a step-by-step Social Media Marketing plan. 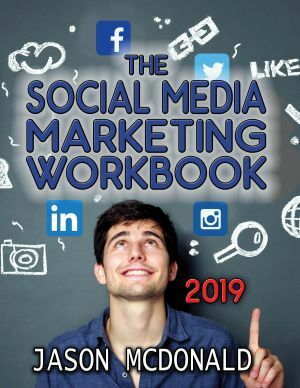 Fully revised and updated for 2019, this workbook not only explains how to market on social media (from Facebook to LinkedIn, YouTube to Pinterest, Twitter to Yelp and back again) but also provides access to free social media marketing tools. It provides overviews, step-by-step instructions, tips and secrets, resource tips for social media marketing, and (wait, there’s more!) access to worksheets that will help you build a systematic social media marketing plan. Even better, if you register your copy, you also get access to my complete Social Media Toolbook, with literally hundreds of free social media marketing tools to turbocharge your social media marketing not just on Facebook but also on LinkedIn, Twitter, YouTube, Google+, Instagram and other major social media platforms. It slices, it dices. It explains how to social media works. It gives you free tools. And it helps you make a social media marketing plan. Why Market via Social Media? If you’ve read this far, you’re definitely intrigued by social media as a marketing platform. Perhaps you’re just starting out with a Facebook Page for your business, or perhaps you’ve seen your teenager spend hours on Instagram or YouTube, or you realize that the female, shopping demographic is “on” Pinterest. Or you’ve painfully learned that Yelp reviews can make (or break) your business. Social media, after all, is all around us in today’s 24/7 desktop, tablet, and mobile phone environment. Social media is big. Facebook, the largest social media platform, has over one billion users worldwide and climbing; LinkedIn with over 350 million members is “the” network for B2B marketers. Every minute 300 hours of video are uploaded to YouTube, and nearly everyone goes to Yelp or Google+ to check out reviews on local businesses. Social Media can reach not only existing but also new customers. Between organic and paid reach on sites like Facebook or Twitter, you can not only stay in touch with your existing customers, you can also be discovered by new customers. Unlike on search engines like Google (where customers must pro-actively look for you), on social media you can be discovered as customer No. 1 shares information with customer No 2. Enter the Social Media Marketing Workbook, a workbook that helps you understand the “how” of marketing your business on social media. This workbook is aimed primarily at small business owners and marketing managers. Non-profits will also find it useful. If you are a person whose job involves advertising, marketing, and/or branding, this workbook is for you. If you are a small business that sees a marketing opportunity in social media of any type, this workbook is for you. And if your job is to market a business or organization online in today’s Internet economy, this book is for you. Anyone who wants to look behind the curtain and understand the mechanics of how to market on social media (from Facebook to LinkedIn, Twitter to Yelp, Pinterest to YouTube and beyond) will benefit from this book. Anyone who sees – however dimly – that social media could help market their business will benefit from this hands-on workbook.